The ‘225 patent describes a system where the environment of the game changes based on the player’s movement during the game. A player, when he looks around him in a game, sees the surrounding environment immediately surrounding his character. The invention calculates the distance between the player and the boundary to determine what display should be shown. 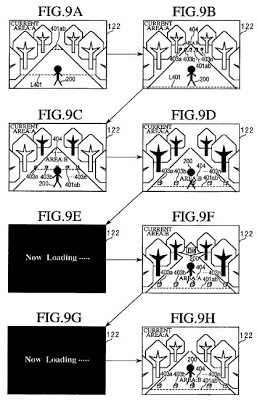 Whenever his character reaches the boundary of what the character can see, the invention updates the map and a new section is loaded; this provides a seamless transition from scene to scene without the player having to wait while the new area is loaded. When movement of a player character is instructed, a position and a direction of the player character after movement thereof are calculated. When the calculated position of the player character after movement thereof is in a moving-to area moved from a current area over a boundary therebetween, map data of a body of the area moved from the current area and map data of a boundary area including a part of the moving-to area are loaded into a RAM from a recording medium, and then the player character is positioned in the moving-to area to be displayed on a display screen. When the player character is positioned in the boundary area near the boundary, a boundary object is displayed at a predetermined position above the boundary in a virtual three-dimensional space. 1. A game apparatus that executes a game which progresses by moving a player character in a virtual three-dimensional space having a field including a first field and a second field provided therein, the second field communicating with the first field via a predetermined moving path, and displays a screen showing a status of the game on a display device, the game apparatus comprising: a map data fixed storage for storing first map data including graphic data of the entire first field and a partial area of the second field near the moving path, and second map data including graphic data of the entire second field; a movement input for inputting an instruction to move the player character in the virtual three-dimensional space according to a player operation; a mover for moving the player character in the virtual three-dimensional space having the first field and the second field according to the instruction input from the movement input; a high-speed storage, having a faster data reading speed than the map data fixed storage, comprising a character data area for storing character data comprising graphic data of the player character, a map data area for storing map data corresponding to a field that includes a position to which the player character has moved, and a boundary data area for storing boundary data including graphic data of a boundary object indicating a boundary position between the first field and the second field, the boundary object not constituting the field; a map data loader for retrieving the second map data from the map data fixed storage, and for storing the retrieved second map data as a substitute for the first map data having been stored so far when the player character is moved to the second field from the first field; a positional relationship determiner for determining a positional relationship between the boundary position between the first field and the second field and a position of the player character when the player character is positioned in the first field, the positional relationship determiner including a distance determiner for determining a distance between the position of the player character and the boundary position; a boundary object layout device for laying out the boundary object at the boundary position between the first field and the second field when the player character is determined to be positioned in a predetermined range set with the boundary position being a criterion, by the positional relationship determiner; a perspective transformer for performing perspective transformation of a range of the virtual three-dimensional space including the position of the player character, onto a virtual screen from a virtual camera to generate a two-dimensional image to be displayed on the display device based upon the map data stored in the map data area and the character data stored in the character data area, and additionally the boundary data stored in the boundary data area when the boundary object is laid out; and a display controller for displaying the two-dimensional image generated by the perspective transformer on the display device, wherein the boundary object layout device comprises a distance mode changer for changing a display mode of the boundary object laid out at the boundary position in accordance with the distance determined by the distance determiner, and wherein the distance mode changer changes a transparency of the boundary data so that the transparency becomes lower as the distance determined by the distance determiner becomes shorter.